Singapore is proving to be a technology bridge between Australia, Europe and the Asia-Pacific region, at least that’s the road being taken by public transport technology provider INIT. 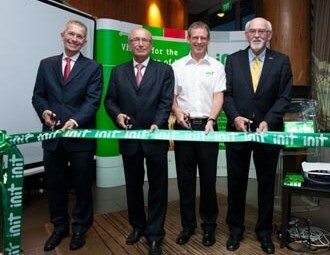 INIT opened its new Singapore office this month. INIT opened its new Singapore office this month, immediately after its involvement at the BIC national conference in Canberra, then returning to Perth for the regional UITP symposium. INIT Asia Pacific Managing Director Paul Gwynn will head the new office while continuing to engage with Australian-based public transport providers. Gwynn says the Singapore office will look after greater Asia and the Pacific, including Australia and New Zealand, and will continue to work closely with Bernd Gorenflo who continues to manage the Australian operation from Brisbane. "We will share resources between Singapore and Brisbane," Gwynn says. "But our primary focus from Singapore will be Hong Kong, Macau and surrounding countries." Gwynn had spent the past year 'commuting' between INIT's global head office in Germany and Australia and New Zealand. Other than assisting with the recent launch of the Singapore office with a fanfare event at the world renowned Singapore Flyer, Gwynn is also a planning systems specialist, presenting at the recent UITP symposium in Perth. UITP is the global peak organisation representing public transport operators around the world, of which Gwynn is the chairman of its technology committee. And over the past year, Gwynn has been a regular visitor to INIT's Australian headquarters in Brisbane. "We opened the Brisbane office in 2007, and we've done quite a lot from Queensland in recent times," he says. Elsewhere in Australia, INIT recently gained business with Metro Tasmania, supplying a planning suite to replace an ageing software system. And back in Brisbane, INIT is the lead provider of an on-board real time tracking system on a large part of the TransLink bus network, operated by Clarks Logan City. But as for Singapore, Gwynn is aware of the city's regional status as a leading public transport provider. "But it's been a while since Singapore invested in technology, so I will be helping them go forward with their next round of investment," he says. Gwynn says 2012 has proven to be INIT's best as it approaches 30 years of operation, continuing to expand its operations globally. "This is a really exciting time to be with INIT," he says. "This year will be our best ever, continuing the trend that we have established for the last eight years. "Our customers realise the tangible value of our experience in successfully delivering very large, truly integrated multimodal and multi-client ITS systems for public transport."